Identify the natural characteristics and beneficial design opportunities, including the variety of textures, colors, and size options, for different type of Texas limestone. Investigate the manufacturing process of Texas limestone and its suitability for both interior and exterior building applications. Assess the different methods of securing different types and thicknesses of limestone onto buildings using conventional means and metal frame systems. Specify and describe safe and durable installation, anchoring, and sealing practices for Texas limestone on residential, commercial, and institutional building facades. The tradition of using cut stone for buildings has been common since the time of the Greek and Roman Empires and used even earlier in Egypt, England, Ireland, and elsewhere. Some of those ancient buildings and monuments still exist today and are intact in part because of the stone material used but also because of the ways it was designed, handled, and crafted into the buildings. Today, the same is true. Cut stone of different types is still used in buildings that seek to convey a sense of permanence, a particular style, or a connectivity to the environment by using natural materials. Limestone in particular has been used as a material of choice for building facades for centuries. It is available in many parts of the world, is fairly easy to cut and carve, and has proven itself over time—in fact, the Great Pyramids in Egypt are constructed largely of limestone. A little closer to home, limestone from Texas has some specific characteristics and varieties that make it distinct and even unique compared to other limestone around the world. For building designs that need to rely on great aesthetics, long-term durability, and a range of design options, it is worthwhile learning more about Texas limestone. 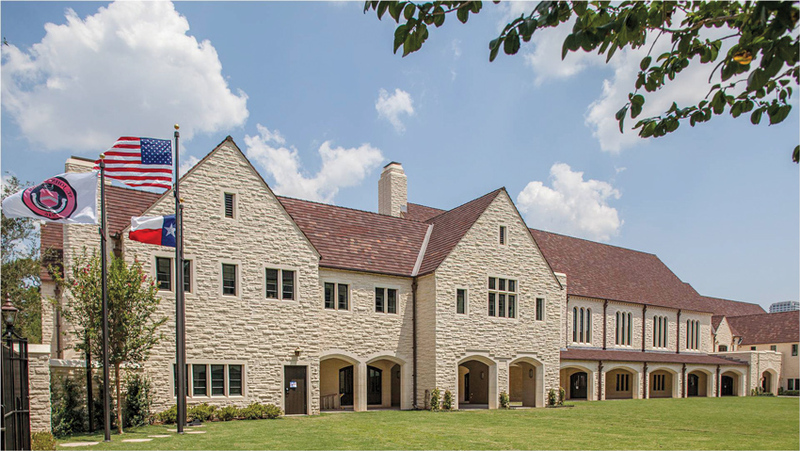 Texas limestone is used for its appearance and durability in commercial, institutional, and residential buildings, including St. John’s school in Houston, Texas. In geological terms, limestone in general is considered a common mineral. It is made up mostly of calcium carbonate (CaCO3) and forms primarily in shallow sea water from marine life, such as clams, scallops, or coral, which use calcium and bicarbonate in the water to form their protective shells. Over time, as the organisms die and the shells are left behind, they fall to the bottom and accumulate in layers, where they combine together to form what we know as the sedimentary rock called limestone. Its abundance on land around the world reveals the places where vast oceans previously existed millions of years ago. The variety of different types of limestone in different locations also speaks to the variety of conditions and marine life that likely existed in different places and at different times. Some limestone is of a mixed makeup and is treated as a commodity. This is the type that is commonly used for gravel or stone in some places in the United States. It can also be used for industrial purposes, like the creation of Portland cement, lime fertilizer, or as an additive in products like paints, roofing, and even paper. But sometimes a vein of limestone is discovered that is rather pure and consistent in its makeup. Pure limestone is almost totally white, but the presence of some other substances can give limestone different colors. This type is suitable for specialized purposes where appearance and durability are important, such as building facades or interior walls. 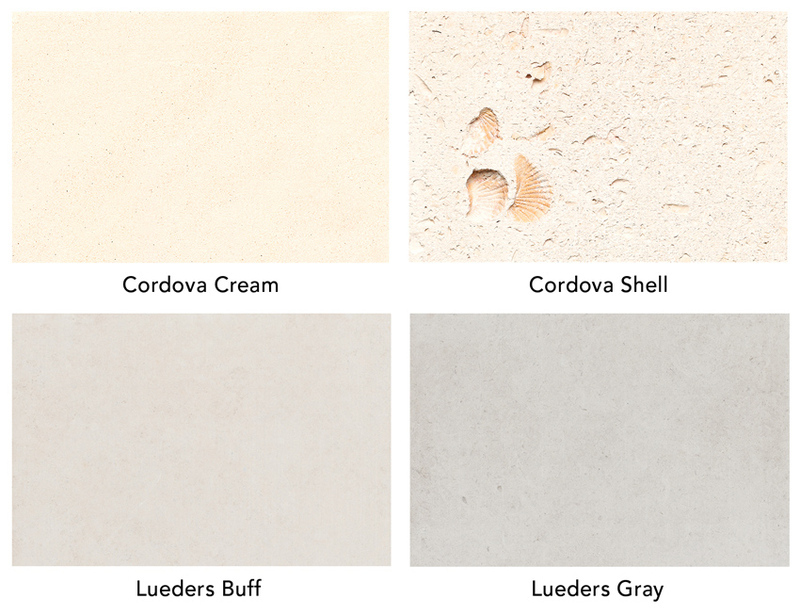 Texas limestone exhibits all of these overall properties and characteristics of limestone. What makes it a bit more unique is the ready availability of a large quantity of high-quality, pure limestone, and the range of colors and textures available. Some Texas limestone quarries, for example, have been providing high-quality material to building projects across the country and overseas since the 1920s, and there is still plenty available. The range of colors includes not only white, but creamy beiges, some light grays, and some with hues of reds and browns. 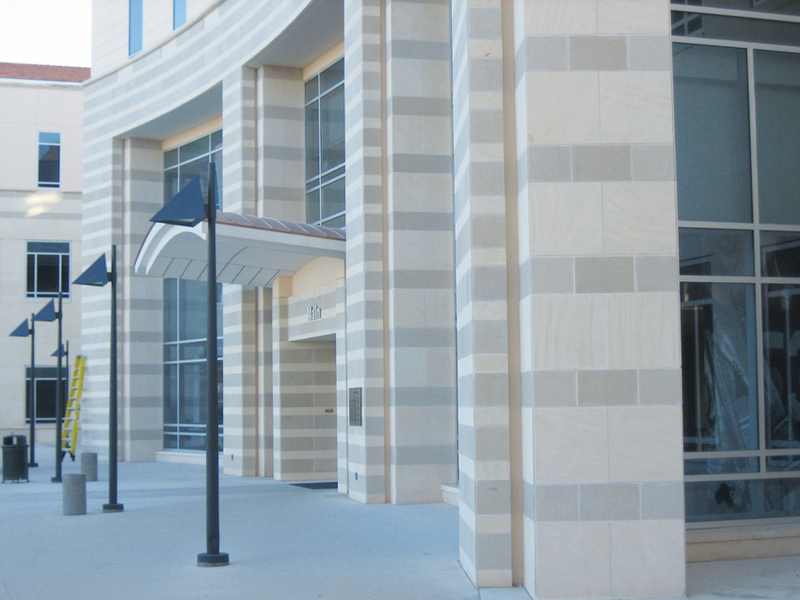 The variety of colors of Texas limestone allows for different patterns and design capabilities as shown here in Academic Building III at the University of Texas, San Antonio. Texas limestone is typically used for interior and exterior wall surfaces. On interiors, the variety of color and texture can allow for an appropriate palette to create many different design schemes that work well with other materials. On the outside, the stone can provide the weathering surface of the building as an integral part of an overall facade or wall assembly design. Used in vertical surfaces this way, the material should hold up quite well over time as a very durable and elegant design solution. On horizontal surfaces, such as outdoor pavers, limestone can work well in low-traffic areas, but the details of installation should be reviewed with the supplier. Checking with the quarry about the suitability of a particular type of limestone to be used in a horizontal application is also advisable since different types of limestone or simply different quarries may produce stone that is better suited to horizontal applications than others. Of course, Texas limestone, like all limestone, has a few things to keep in mind when considering its use. First, as a sedimentary rock, it is a very porous material. In order to avoid any possible degradation over time from water penetration, this can be addressed by sealing the surface of the stone or using it in locations where the porosity is not a concern. Similarly, it is a chemical mineral, and as such can react with other chemicals, including acid-based cleaners. That can be avoided with the use of neutral or mild alkaline-based cleaners when needed. In terms of the size and detailing of the stone, those factors will be very dependent on the quarry and fabricator, which may be the same company. 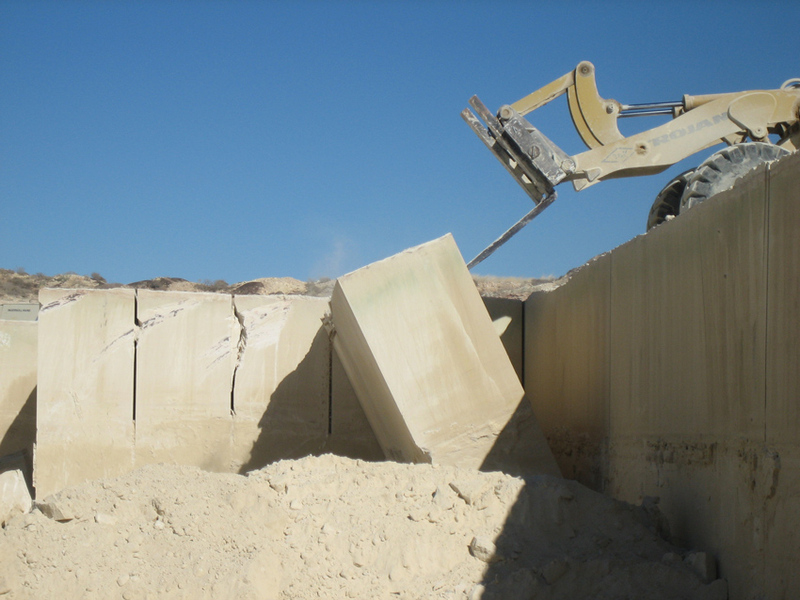 The raw block size from the quarry will determine the maximum size of a piece of cut stone or the best smaller sizes to avoid waste from a single slab. There are many fabrication possibilities, but checking with the actual fabricator ahead of time will avoid any unwanted surprises later on. Most quarries operate at the surface by removing any vegetation and topsoil and digging downward. At some point, a particular quarry stops being economical either because the limestone becomes more difficult to extract the quality changes, or the supply is simply depleted. There are certainly cases where the quarry operation simply stopped and left, leaving an open hole in the earth with little chance of any productive or environmentally beneficial use for many, many years. In some cases, this condition was harmful to the environment or dangerous to people. Fortunately, more and more quarries have accepted the responsibility of reclaiming and restoring the land when the stone extraction process is complete. This is done by filling in some or all of the hole left in the ground with natural materials—sometimes returning stone waste and scrap from the quarry operations itself. It can also be done using natural material from excavations in the area and covering the top with stored topsoil or similar material to allow natural vegetation to return. There may also be the opportunity to create a water feature, such as a pond or small lake, in some cases. Either way, the responsible end result is for the land to be fully restored so it can take on a new life being functional and part of the surrounding environment again. Quarry operations of limestone involve cutting large blocks and then tipping or leaning them onto their side to be carried to the mill. In the context of responsible extraction, then, Texas limestone is quarried comparable to most other stone extraction. 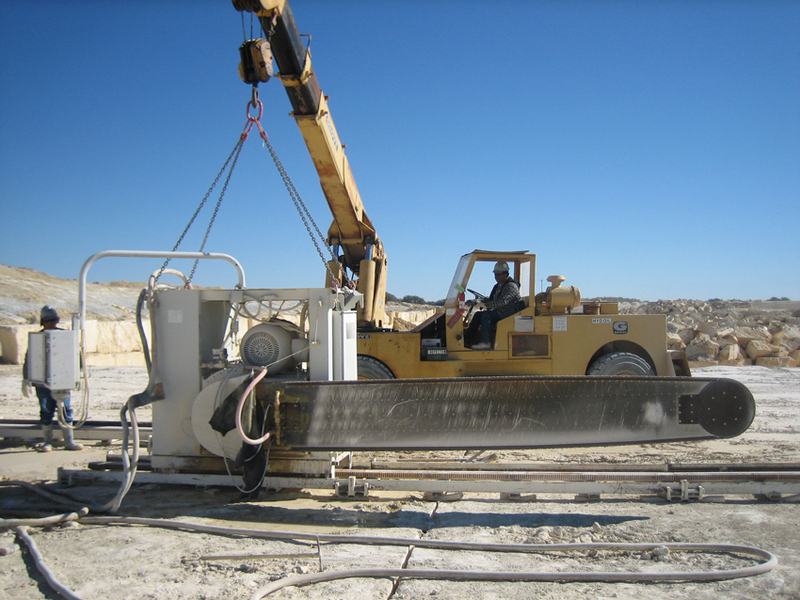 The surface of the exposed limestone is cut or sliced from the top down into large sections, commonly using portable stone-cutting equipment. One vertical side of those sections is commonly exposed so that hydraulic equipment can then separate the sections, or ledges, by pushing them to turn onto their side. The resulting blocks are commonly on the order of 4 feet wide by 8 feet tall by 4 feet thick. Additional equipment is then used to pick up and move these blocks to a staging area ready for next steps. 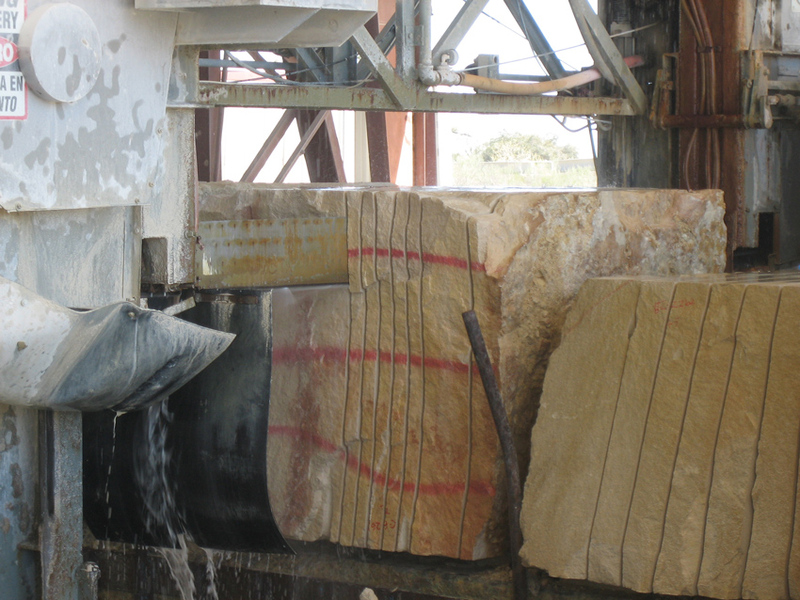 While some quarries only provide the rough blocks, others provide further cutting and shaping through mill fabrication capabilities, thus offering a single-source responsibility for all aspects of the stone. In the mill operation, the block is sliced into slabs that can vary between 1¼ inches to 6 inches or more in thickness. Generally, the larger the size of the final panel, the thicker it needs to be in order to maintain inherent structural integrity. For example, if a final panel size of 1 foot by 2 feet is needed, then a thickness of 1¼ inches would be appropriate, thus producing a thin veneer product. If a panel size up to 3 feet by 5 feet is required, then a corresponding thickness of approximately 2¼ inches would be needed. If a full-sized panel up to 4 feet by 8 feet is desired, then the thickness would need to be on the order of 3 to 4 inches. The thicker the panel, the heavier it is, so the weight will increase at a higher rate than just the increase of surface size. Fabrication of Texas limestone includes addressing the thickness as well as the edges of the final pieces dimensioned to the needed sizes. Once the panels are cut to the appropriate size and thickness, they are ready for further fabrication. One of the first considerations is the type of face treatment or texture that is desired since there are many options. 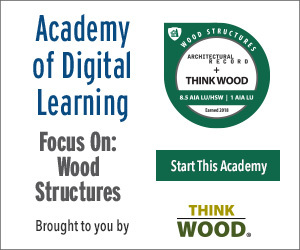 The blocks can be chopped or split to create an intentionally rough surface and exposing a natural inner texture. If the intent is to create rounded or smooth edges that can make the stone blocks look aged or older, then they can be pitched or tumbled to create that affect. Alternatively, they can keep more defined corners and receive a “roughback” surface that carries a more controlled rough texture. A more subtle texture can be achieved using a bush hammer or other equipment to create varying degrees of more subtle texture. If rough or rustic isn’t the appearance being sought, then it is also possible to achieve a fairly smooth and precise look in limestone. This is done by honing the surface to the desired smoothness to create a more uniform look and appearance. 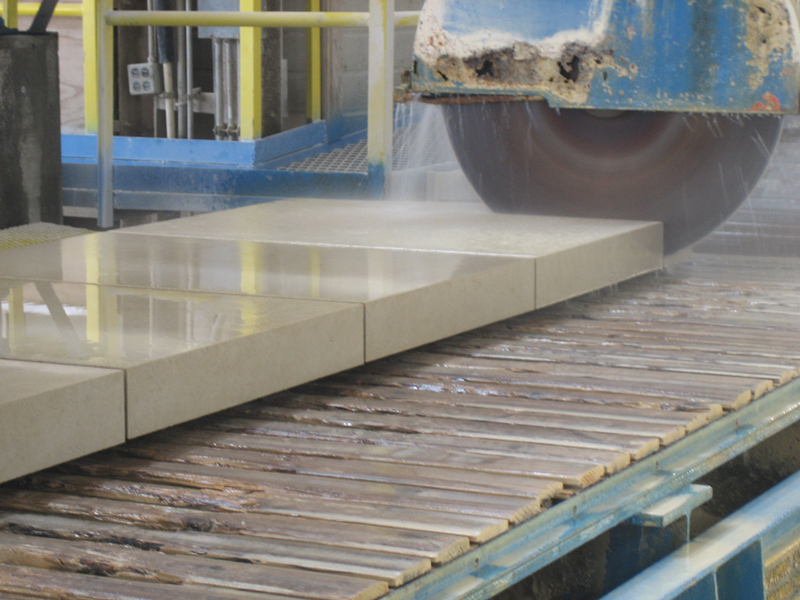 Automated machinery can be used to cut honed slabs to more precise final sizes. The edges can be processed to obtain a square, chamfered, rounded, or other edge profile, as may be desired. If desired, different profiles, miters, or other detailing can also be performed according to architectural design and specifications. Either way, once the individual pieces receive the proper surface texture and are dimensioned to the proper sizes, they are ready to be crated and shipped to the project site. Texas limestone is available in a variety of surface textures such as the fairly rough split block (left), a more subtle rustic finish (center), or honed smooth (right).